Montauk Point Ferry - Viking Fleet Ferry Serving Montauk, Block Island, Rhode Island, New London, Connecticut, and Martha's Vineyard, Mass. 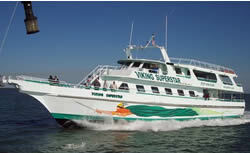 Take the Viking Fleet Ferry to Block Island from Montauk or to New London and Mystic, Connecticut. Only passengers are accommodated on these ferries, but room is made for bicycles. The ride is about 1 and a half hours each way, but this depends on the weather and ferry as well. You will take the Viking SuperStar to your final destination. This ferry is brand new and it was custom designed so you will really enjoy your ride. In some instances you may take a different ferry, but in most circumstances the Viking SuperStar will be the ferry. This ferry was designed specially by Captain Paul Forsberg so that it would be perfect for traveling the Montauk Waters. This is a high speed ferry that is 120 feet long and has a special design for all of you who get seasick. The ferry offers a special stable design that reduces the rocking motion that causes seasickness in so many. The Viking SuperStar offers inside and outside seating that is comfortable and adequate for up to 225 passengers. You won't worry about getting too cold or too hot either because there is heat and air conditioner on this ferry to keep you comfortable while traveling. Once on board you will really enjoy the availability of snacks and drinks in case you get hungry or thirsty during the crossing. Those carrying surfboards or bicycles will have no problem storing them on board, but they will be traveling at their own risk. While on board check out the three decks and plan for a photo on the upper deck when you are close to your final destination. Viking Fleet does not offer auto ferry service, but chooses to focus specifically on passengers. Reservations should be made to ensure availability. Reservations may be made online or by phone and they are non-refundable. Visa and MasterCard are accepted. The Viking Fleet also offers fishing specials so if you are an avid fisherman you should definitely check out what's available. There are day trips and several day trips to catch all kinds of different fish. Of course the season will affect what you fish for, but year round fishing trips are offered so you can catch just about whatever you want when you head on one of these trips. The cool thing is that most of these fishing trips are all inclusive so once you pay for the trip you don't have to pay for anything else. That's because the one time fee includes bunk, food, drinks, gratuity, tackle, cleaning, fish storage, and more. Many world record fish have been caught on some of these trips so if you are serious about fishing Mahi Mahi, Tuna, Squid, Cod, and other types of fish then you must check out some of these fishing trips and great prices. Go ahead and check out the website www.vikingfleet.com to learn more about the long island fishing trips and ferry destinations and schedules. From there you can learn everything you need to know, make reservations, and call with any questions.